Today is Steve Wagner’s 61st birthday. 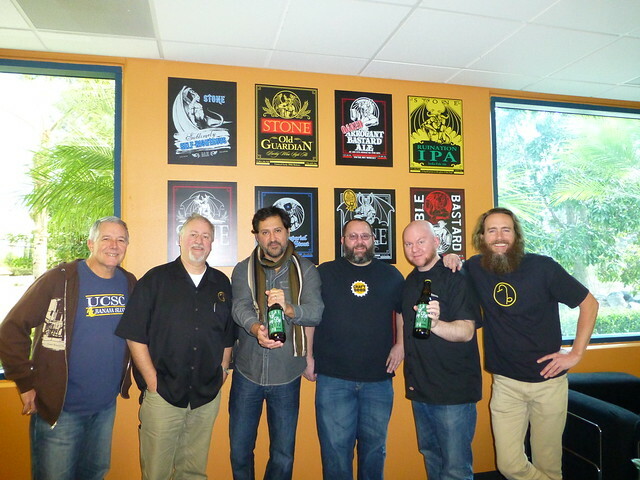 Steve is a co-founder of Stone Brewing and the president of the California Craft Brewers Association. In the late 1980s, Steve was a member of the band “The Balancing Act,” who put out several albums on I.R.S. Records. Now he just presides over one of the most successful microbreweries in the U.S. Join me in wishing Steve a very happy birthday. 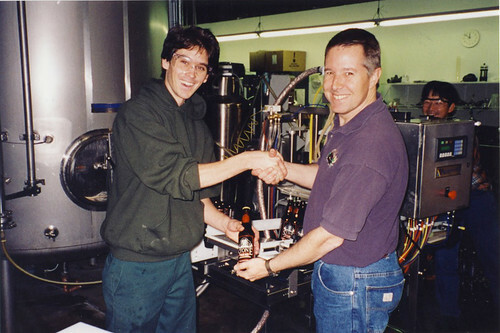 Mitch Steele, Stone Brewing’s brewmaster, with Steve, at CBC when it was in Austin, Texas. 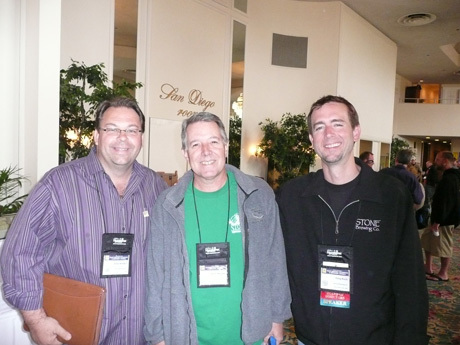 The Stone crew: Arlan Arnsten, Steve and Greg Koch at CBC in San Diego 2008. 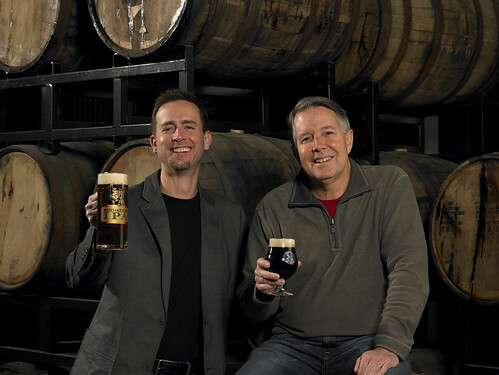 With Stone Brewing co-founder Greg Koch in a publicity shot (by John Schulz Photography). The day after we tried all of Stone’s Vertical Epic’s in San Diego; with Steve, me, Joe Tucker, Jason and Todd Alstrom and Greg Koch. 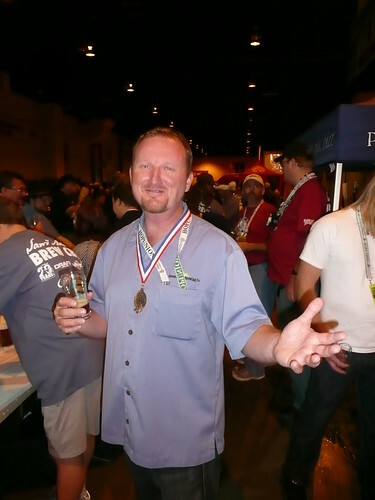 Today is the 46th birthday of Lee Chase, co-owner of Blind Lady Ale House in San Diego, and brewer at Automatic Brewing, located in the Blind Lady’s back room, and brewery consultant to the stars. 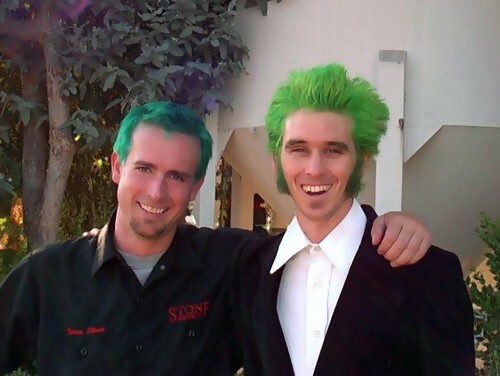 Chase was also the head brewer at Stone Brewing for nearly a decade and oversaw the building and installation of the new brewery in Escondido. Lee’s a terrific brewer and a great beer ambassador, and also great fun to hang out with a share a pint, which I was able to do a few Decembers ago at the Stone Vertical Epic Tasting. Please join me in wishing Lee a very happy birthday. Lee at Beer School for CitySearch San Diego in 2008. 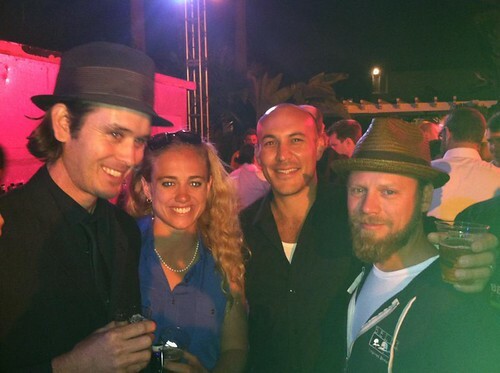 Lee, with Meg Gill, Garrett Marrero and Matthew Brynildson at CBC in San Diego a few years ago. 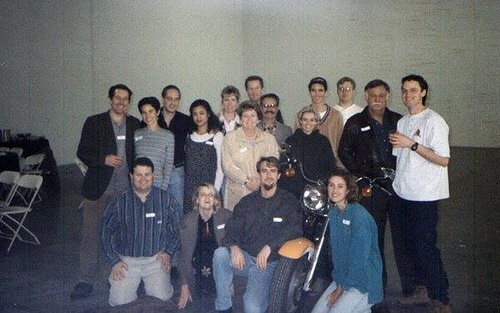 Lee, and several other Stone employees, along with some other beer people, around 1996. 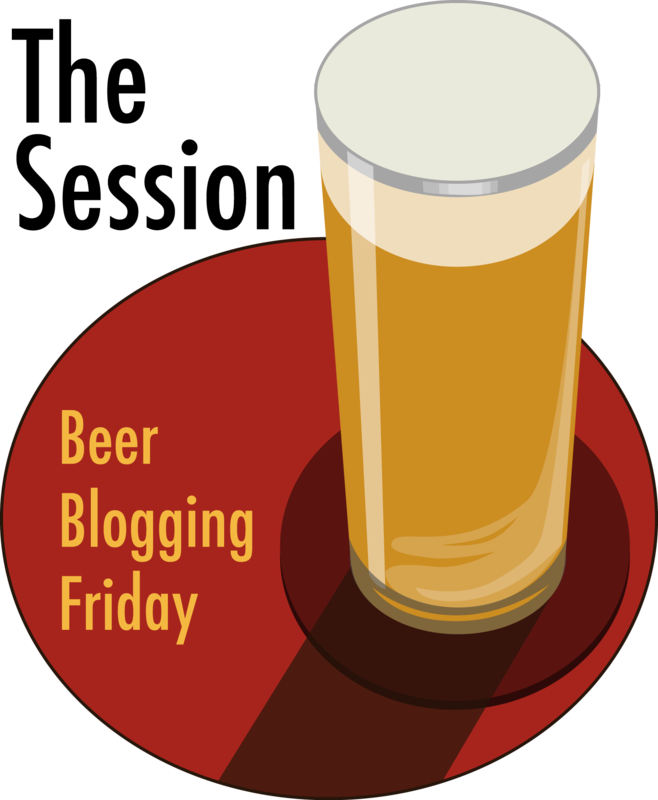 Today is also the birthday of Chuck Silva, former brewmaster at Green Flash Brewing in San Diego. His West Coast IPA has taken the world by storm, and personally, I loved his Tripel and Le Freak. The big, shiny new brewery they recently built is also pretty amazing. 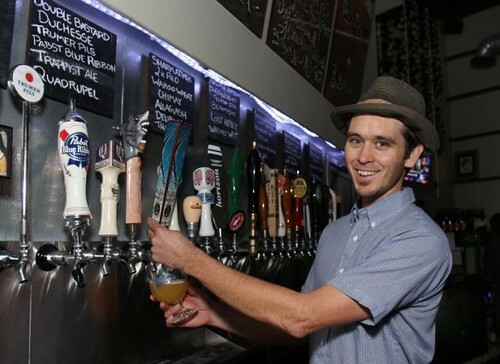 But eventually Chuck wanted to something of his own, and he recently opened Silva Brewing Company in the Central Coast of California, around his native San Luis Obispo area in Paso Robles. Join me in wishing Chuck a very happy birthday. Chuck at GABF two years ago. 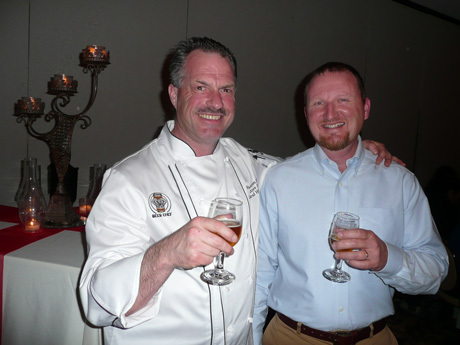 The beer chef, Bruce Paton, with Chuck at one his beer dinners. Chuck at Mammoth Lakes Bluesapalooza in 2007. 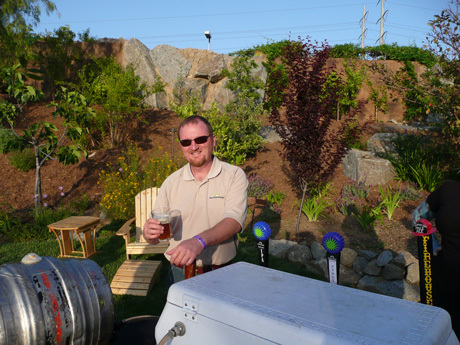 Chuck serving the symposium beer at Stone Brewing during Craft Brewers Conference in San Diego in 2008. Today is the 57th birthday of Mitch Steele, former production manager/head brewer at Stone Brewing. Mitch started out at the tiny San Andreas Brewery in Hollister, California but spent a number of years at one of the much larger Budweiser breweries when he brewed for Anheuser-Busch, before finding a home at Stone. More recently, he’s left that job to create something of his own, in Atlanta, Georgia. New Realm Brewing opened officially in January of this year. 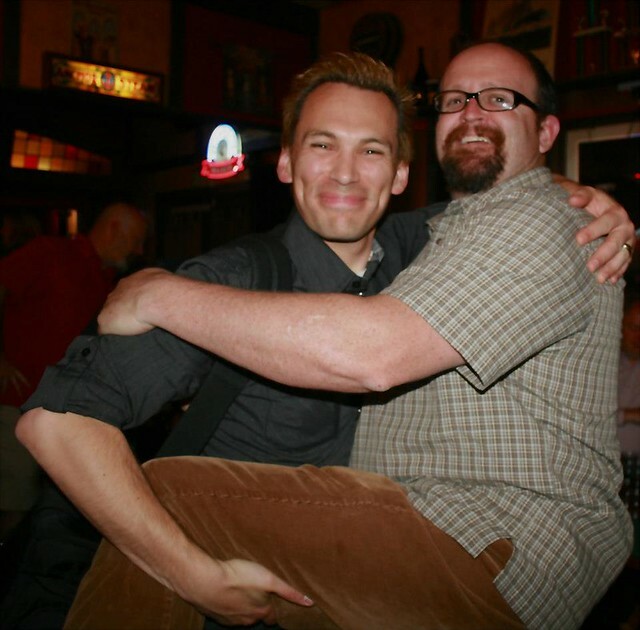 He’s obviously a terrific brewer but is also a great person and close friend, too. He has been my roomie for GABF judging a couple of years and is also the author of IPA: Brewing Techniques, Recipes and the Evolution of India Pale Ale. He’s a big advocate for craft beer and always willing to help out a fellow brewer or homebrewer. Join me in wishing Mitch a very happy birthday. 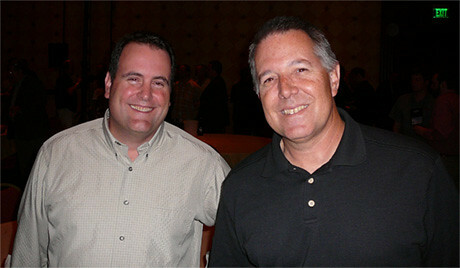 Mitch with Stone co-founder Steve Wagner at the Craft Brewers Conference in 2007. Mitch picking up his 3rd Place award on the floor of GABF 2009 for Stone’s Levitation Ale on cask at a special judging at the Great British Beer Festival in 2009 (and which I had the pleasure to judge). Betsy Hensley, Judy Ashworth, Mitch, Brendan Moylan & Bruce Paton at the Celebrator’s 22nd Anniversary Party. 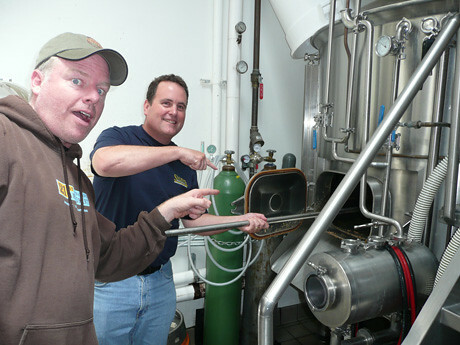 Mitch and 21st Amendment brewer Shaun O’Sullivan practicing their pointing during a collaboration brew in 2008 in San Francisco. 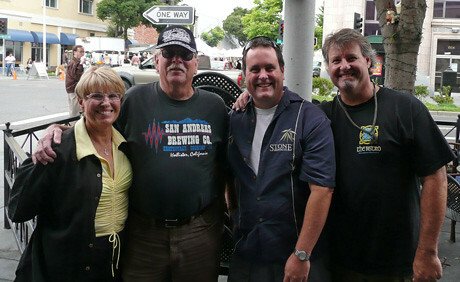 Outside the Bistro IPA Festival in 2007 with Publican Judy Ashworth, Former San Andreas Brewing owner Bill Millar, Mitch and Bistro owner Vic Krajl. Pete Slosberg, Marty Velas, George Reisch and Mitch at Grillshack Fries and Burgers in Nashville during CBC. And no birthday post is complete without a blast from the past. 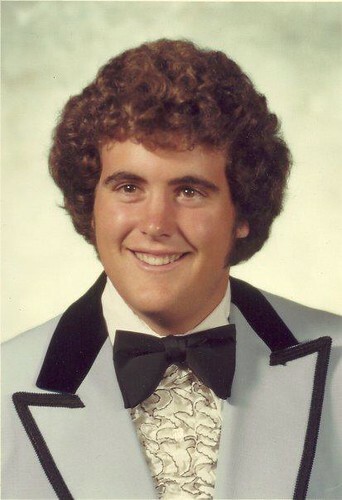 Here’s Mitch’s high school prom photo in all it’s living color glory. It’s from Northgate High School Class of 1980 in Walnut Creek, CA (special thanks to Mitch for updating the old black & white photo with the glorious color one!). Love the powder blue tux. Today is Tomme Arthur’s 45th birthday. Tomme is Director of Brewery Operations for Port Brewing and the Lost Abbey. One of the established stars of the San Diego brewing scene, Tomme is justly famous for his terrific beers, like his Cuvee de Tomme, the Red Poppy, the Angel’s Share and the Track series. Plus, he introduced washoes to the brewing community. Join me in wishing Tomme a very happy birthday. 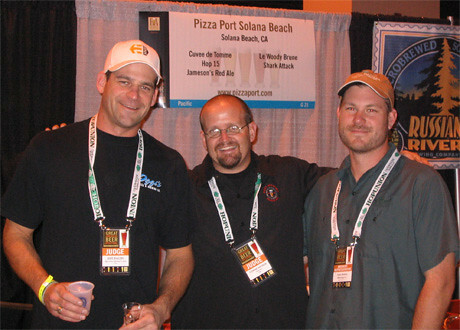 At GABF in 2005. Jeff Bagby, brewer at Pizza Port, Tomme, and Eric Rose, brewer at Hollister Brewing Co..
After the Five Guys and a Barrel Beer Dinner, a toast was offered with Isabelle Proximus, the Collaborative Sour Ale made by blending beer and done by the five of them. Top row: Adam Avery, Rob Tod, Bruce Paton and Sam Calagione. 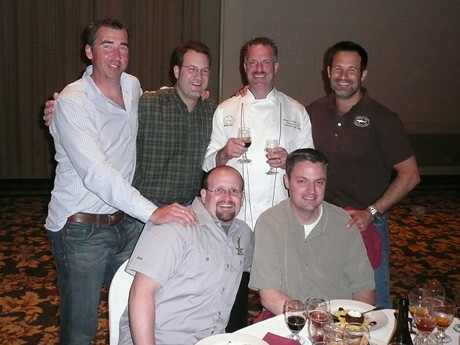 Bottom row: Tomme and Vinnie Cilurzo. Tomme and me after another beer dinner, relaxing in the Cathedral Hill bar with Blind Pig IPA. 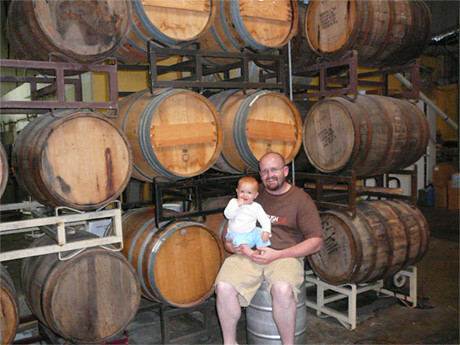 Tomme Arthur and his oldest daughter Sydney in front of aging beer barrels, when she was very young. Karl Strauss was destined to brew beer. Born in 1912 on the premises of his father’s brewery in Minden, Germany, he spent his childhood playing amid beer barrels and sacks of fresh hops and barley. At age 19, he left home for Bavaria, the brewing capital of Germany, to attend the Technical University of Munich-Weihenstephan. There he earned a degree in the science and practice of malting and brewing, as well as a Master Brewer certification. Given the political situation in 1930s Germany, Karl had to look abroad for work. In February of 1939, he boarded the SS Manhatten and set sail for America, in pursuit of opportunity. His job search led him to Milwaukee, Wisconsin, home to one of the most famous breweries in the United States. 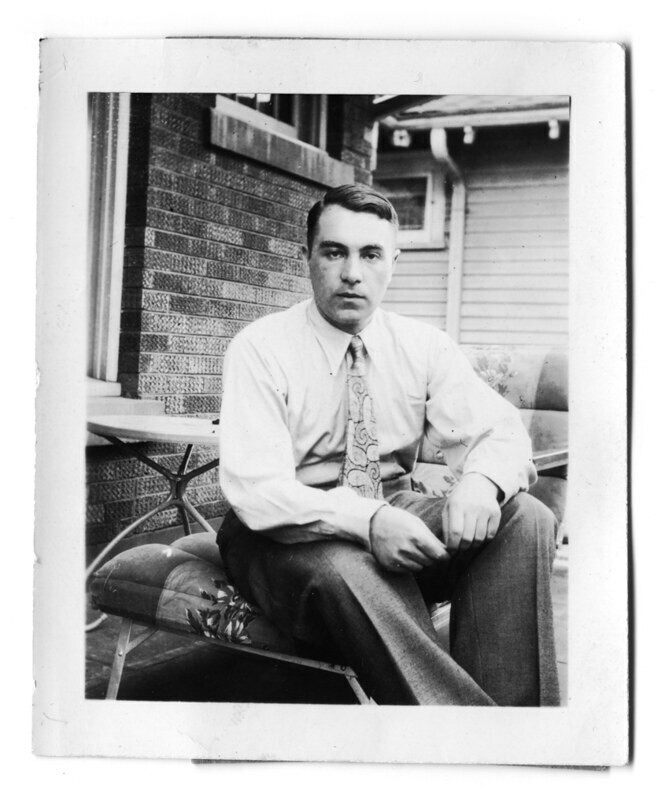 Karl began his career at Pabst Brewing Company on the bottling line in May, 1939. But with his strong work ethic and educational background, he quickly worked his way up the brewing ranks. In the 1950s, he was part of the team that reformulated the recipe for Pabst’s Blue Ribbon beer. The improved version catapulted sales for the company, and PBR remains an American brewing icon to this day. 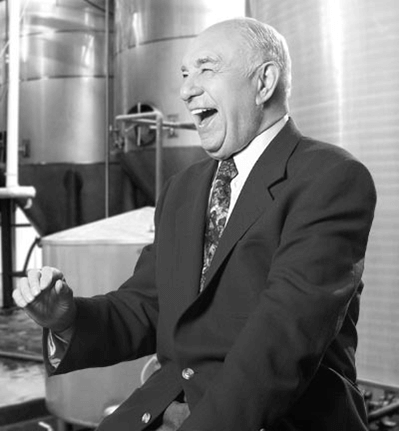 In 1960, Karl became Vice President of Production, overseeing all brewing operations across the country. He held the position until he retired in 1983, after 44 years with the company. Not content to rest after his retirement, Karl launched a new career as a brewery consultant, providing expert advice to breweries all over the world. In 1986, he was approached by his cousin Chris in San Diego about starting a microbrewery. Karl thought it was a great idea. He helped design the brewery, train the brewers, and create recipes for the first beers. He was so passionate about the project that he even lent his name, face and voice to the enterprise. Karl served as Master Brewer from 1989 to 2006, remaining involved in brewery operations until his passing. Karl was very active in the brewing community throughout his life. He was president of the Master Brewers Association of the Americas (1961-1963) and founder and director of the Museum of Beer and Brewing in Milwaukee. He is the only person to have received the MBAA Award of Merit (1981), Award of Honor (1992), and the Distinguished Life Service Award (2003). Karl also believed it was important to pass on the techniques and traditions of his craft to young brewers. 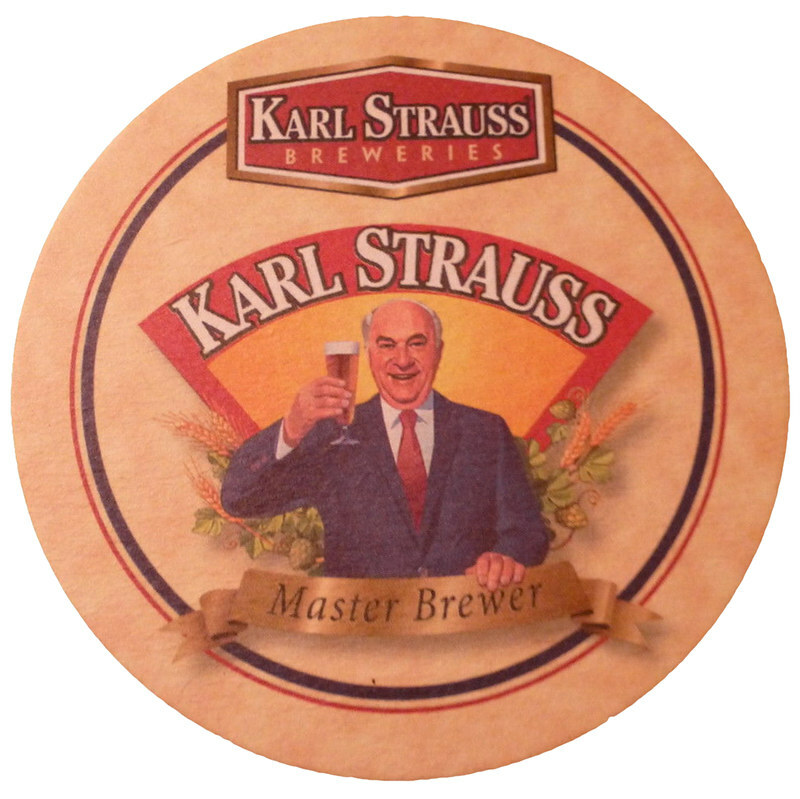 We created the Karl M. Strauss Brewers Education Fund in honor of his work. Karl had a contagious enthusiasm that inspired everyone around him. He was driven by a belief that everyone should enjoy life, preferably with good friends and good beer. 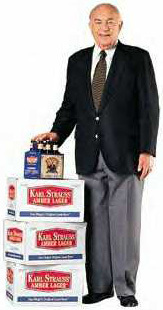 Over the course of his 70 plus years as a brewer, he brewed more than seven billion servings of beer, enough for everyone on the planet to have a Karl Strauss Beer. He was born October 5, 1912, on the second floor of the administration building of the Feldschlösschen Bräu, a brewery in Minden, Germany, of which his father was president. The second born of two boys and a girl to Albrecht and Mathilde Strauss, he attended the Oberrealschule in Minden where he received his Abitur. During his young life he assisted his father as a brewer and intern while living in the family quarters at the brewery. At age 19, he went to the Technical University of Munich at Weihenstephan, where he received a degree in the science and practice of malting and brewing. 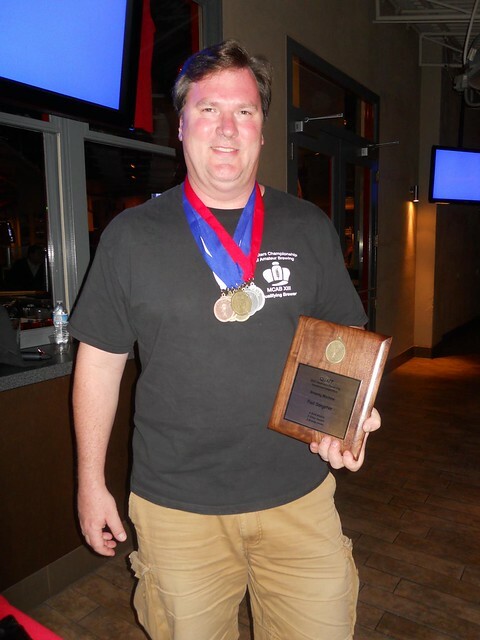 In addition, he received Master Brewer certification, allowing him to teach apprentice brewers. 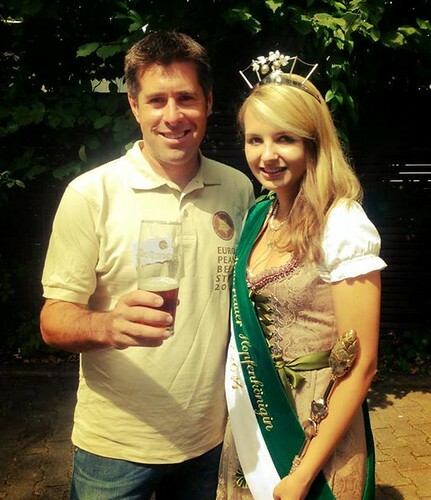 With his diploma in hand, he began working at breweries including the Falkenkreuz Brauerei Lippert in Detmold, Westphalia; the Bauer Brauerei in Lübeck, Holstein; and the Altstädter Malzfabrik in Altstadt, Thuringia. With the rise of the Nazis, Germany was not a safe place for the Jewish Strauss family, and work became scarce. “I graduated from college while Hitler was in power and as a Jew could not find employment in the brewing industry,” he wrote in 1943. Thanks to family living in the United States, he was able to secure sponsorship to emigrate. But other members of his family were not so lucky. The last time he saw his mother was the night he left Germany. She later was killed in a concentration camp. His brother was killed in a Nazi raid on the Polish underground. He began his work at Pabst feeding bottles to the bottle soaker. However, “once Pabst realized that it had a Bavarian brew master in its employ, Strauss quickly advanced.” Within a few months he was promoted to foreman of filtration. He continued to quickly move up the corporate ladder, becoming an assistant superintendent and later malt house superintendent. In 1942, he was transferred to Pabst’s brewery in Peoria, Illinois, as the plant production manager. Within a few years he was made head maltster in Milwaukee and was assistant superintendent of the malt house and brewhouse. In 1948, he was promoted to superintendent of Pabst’s newly purchased plant in Los Angeles, and remained there until 1956. He was named technical director of Pabst in 1958, and promoted to vice-president of production in 1960. He helped Pabst reformulate its beer, as well as create a new Pabst Blue Ribbon. He continued as vice-president until retiring from Pabst in 1983. His first wife died in 1978. He married his second wife, Marjean Schaefer, in 1980. 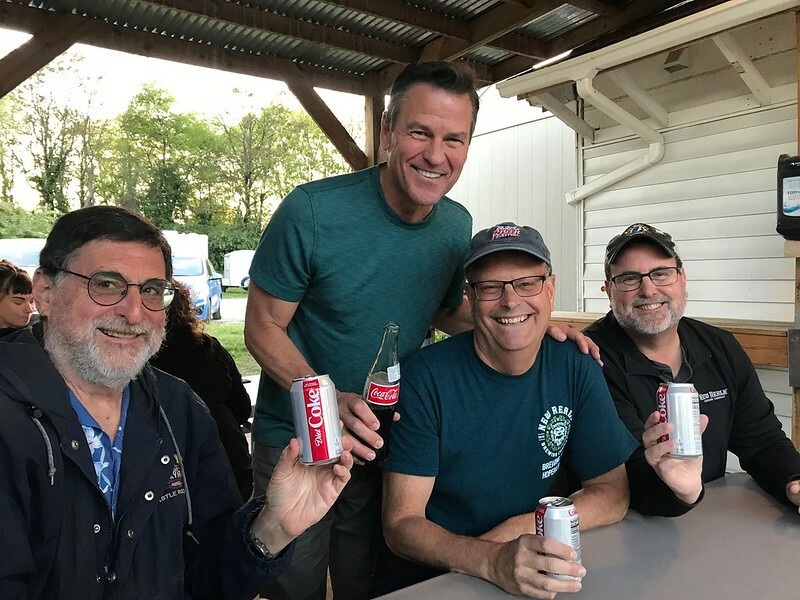 In the 1980s, Strauss began a new career as a brewery consultant, providing services for both large breweries and microbreweries throughout the world. He had clients in Europe, Asia, and North America, including Molson, Tsingtao, The Boston Beer Company, and Goose Island Beer Company. He helped design more than 50 brewpubs and microbreweries. In 1987, a cousin, Chris Cramer, and Cramer’s college roommate, Matt Rattner, asked Strauss to help them develop a brewpub in San Diego, California. 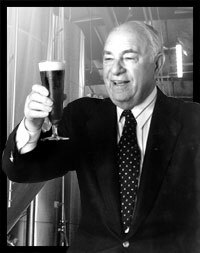 Strauss not only designed the brewery and trained the brewers; he also formulated the original beer recipes and lent his name to the endeavor. Opening on February 2, 1989, Karl Strauss Brewing Company became the first brewery in San Diego in more than fifty years and is credited with having launched the craft brewing industry in San Diego. 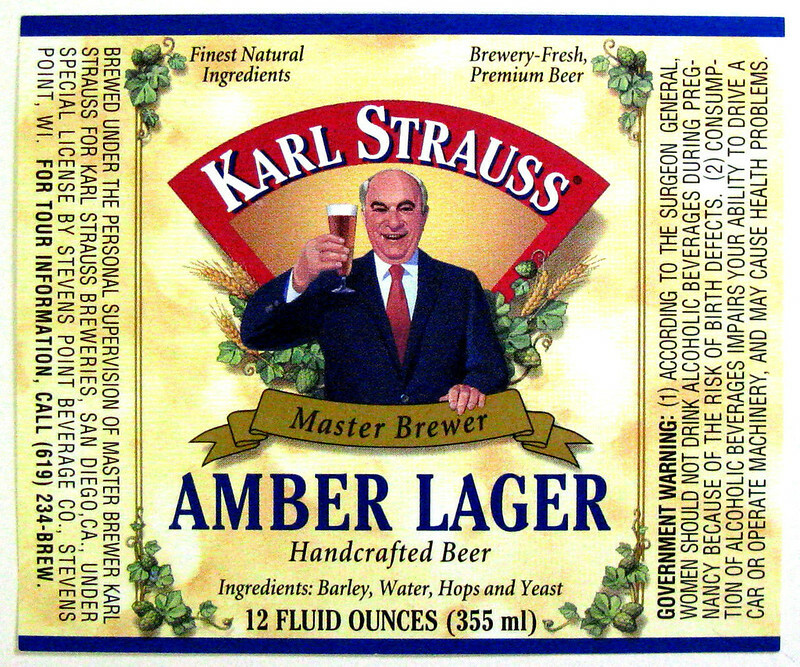 Strauss served as the brewmaster and corporate image of Karl Strauss Brewing Company. As corporate spokesman he made radio commercials in his thick German accent, always concluding “…or my name isn’t Karrrrl Strrrrrauss!”; on the technical side he was heavily involved in the design of the company’s new properties and brewing of new beers. He remained actively involved with the company until his death in Milwaukee on December 21, 2006, at the age of 94. He is buried at Mount Sinai Memorial Park in Los Angeles. 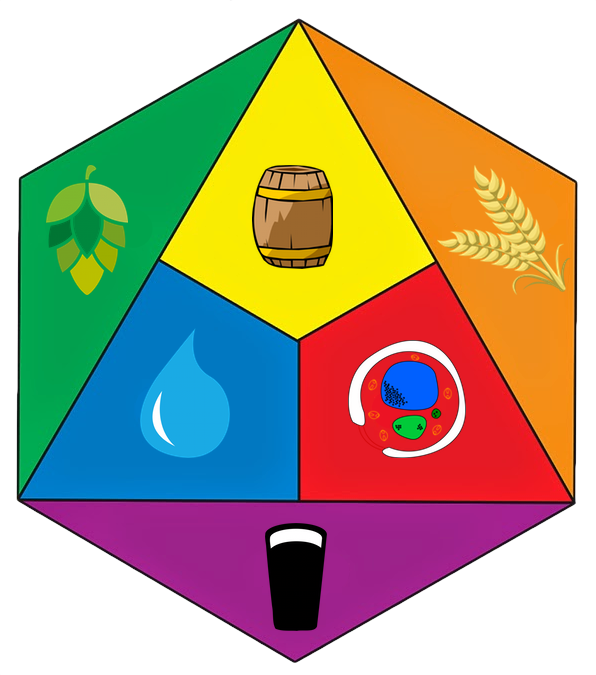 Strauss co-authored a book, The Practical Brewer, published by the Master Brewers Association of the Americas. 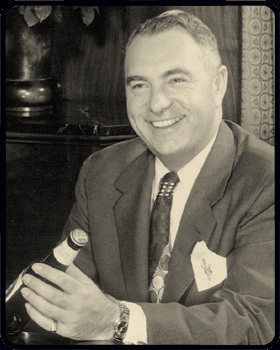 Strauss was president of the Master Brewers Association of the Americas from 1961–63. He is the only person to receive all three of the highest awards given by the association: the Award of Merit (1981), given to an individual or individuals who made an outstanding contribution to the brewing industry; the Award of Honor (1992), given to a member who has rendered outstanding service to the association; and the Distinguished Life Service Award (2003), which recognizes MBAA members who have given exceptional service to the association. Karl was a founder and director of the Museum of Beer and Brewing in Milwaukee. The museum now presents an annual Karl Strauss Award to individuals for lifetime contributions to the industry. In 2006, Karl Strauss Brewing Company set up the Karl Strauss Brewers Education Fund with the Jewish Community Foundation of San Diego. 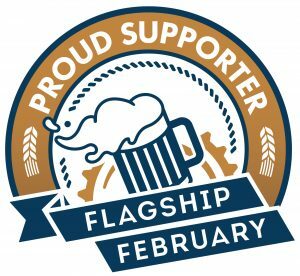 The fund provides financial educational support to aspiring southern California brewers pursuing a career in the field of brewing. And finally, here’s a video celebrating what would have been Karl’s 100th birthday in 2012. Today is the 50th birthday — the Big 5-O — of Yuseff Cherney, co-founder, former COO and head brewer of Ballast Point Brewing in San Diego. 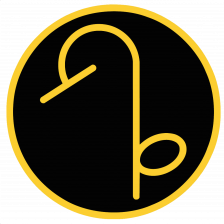 Although not too long after selling Ballast Point in later 2015 to Constellation Brands, Yuseff left the brewery, in July of 2016. I believe he’s focusing his energy on their rebranded spirits division, now called Cutwater Spirits. I used to run into Yusseff in the Bay Area or at GABF, but I’m not sure we’ll see him as much in the beer world. He’s a great person and a terrific brewer and I’m looking forward to trying his gin. Join me in wishing Yusseff a very happy birthday. 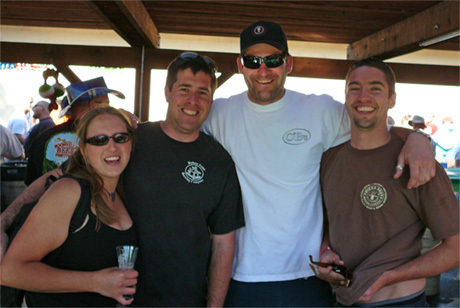 Claudia Pamparana, co-founder of Faction Brewing, Yuseff, Jeff Bagby, and his then-assistant brewer, Noah Regney, now with Hollister Brewing at the Boonville Beer Festival in 2007. 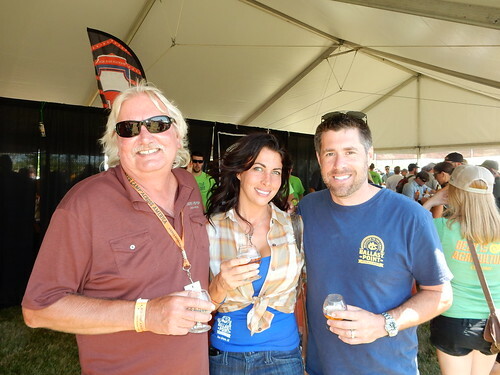 Sierra Nevada’s Steve Dressler with Yuseff and his wife at the Chico leg of Beer Camps Across America a few years ago. 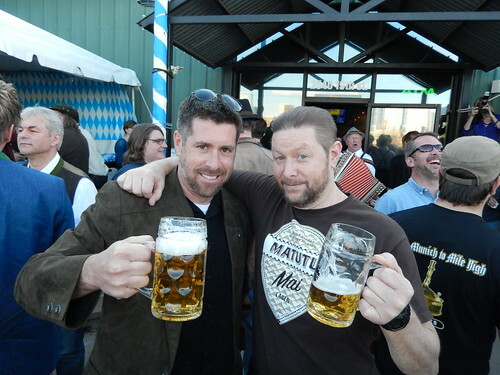 Yussef with Fal Allen (from Anderson Valley) at Prost Brewing during CBC this year in Denver. 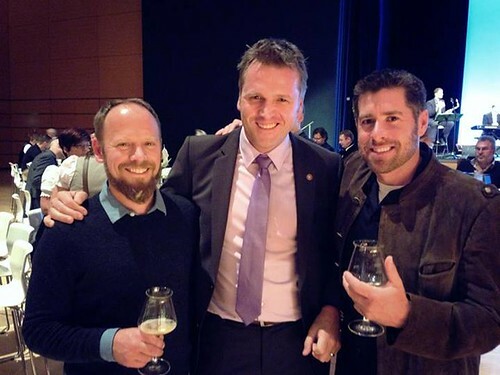 Matt Matthew Brynildson, Earl Kight, and Yuseff at the European Beer Star Awards in Germany a few years ago. 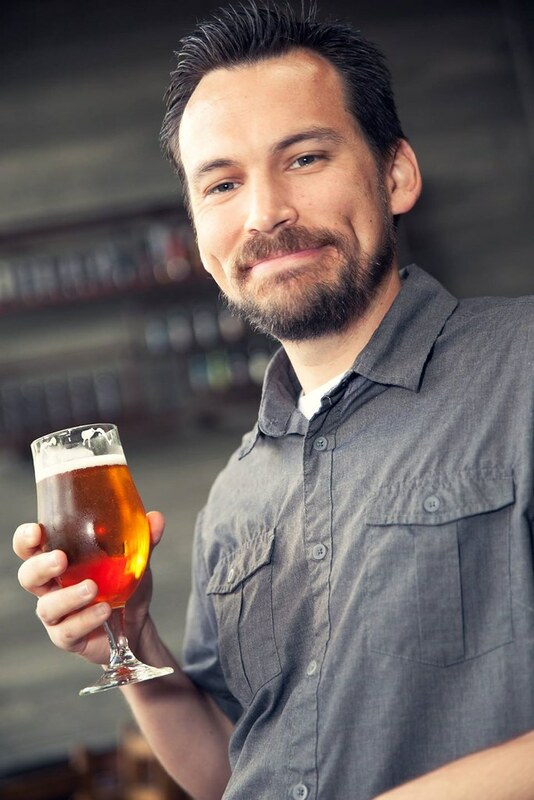 Today is the 42nd (maybe) birthday of Brandon Hernández, who is the Chief Marketing Officer for Societe Brewing, but was a beer writer long before joining AleSmith, and continues to write for the San Diego Reader and the West Coaster, as well as other publications. 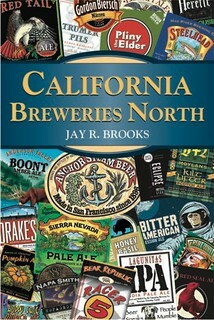 And he’s published the Complete Guide to San Diego Breweries. For a time, he was the Senior Communications Specialist for Stone Brewing, but left to join AleSmith. I run into Brandon fairly regularly at beer functions and he’s become one of my favorite people to hang out with. Join me in wishing Brandon a very happy birthday. Nice towering press photo of Brandon. With fellow writers at the opening event for the CBC in Washington, DC in 2013. 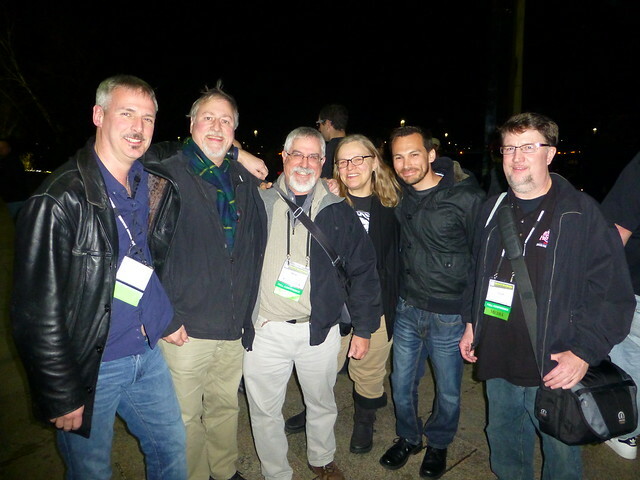 From left, Stephen Beaumont, me, Steve Shapiro, Gail Williams, Brandon and Chuck Cook. 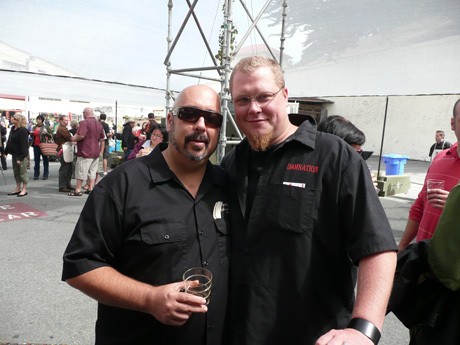 At Churchill’s in San Diego with Tomme Arthur in 2012. 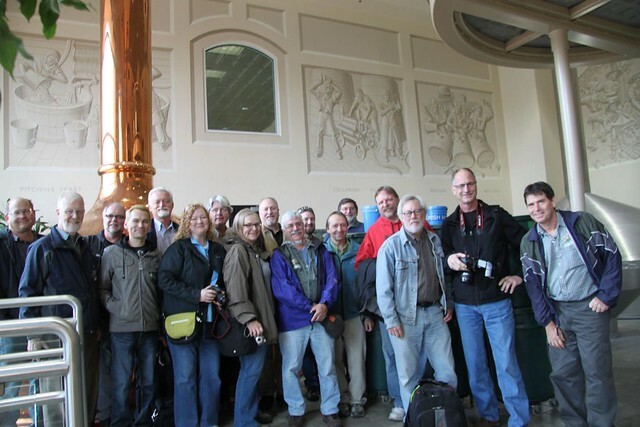 With a bevy of Celebrator writers in Chico for Beer Camp #93 in late 2012, to make a beer celebrating the 25th anniversary of the Celebrator Beer News. That’s Brandon sporting blond hair fourth from the left. 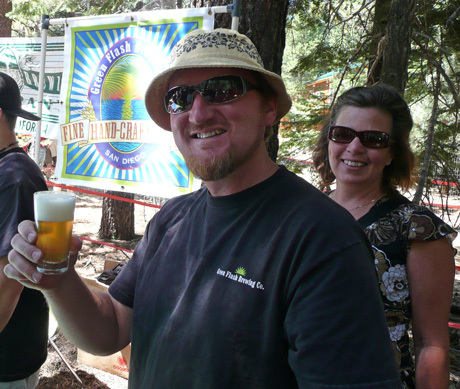 Today is the birthday of Paul Sangster, who is the brewmaster of Rip Current Brewing in San Marcos, California and a co-founder with his partner Guy Shobe. By a strange coincidence, Guy’s sister is our neighbor across the street at the home we bought nearly six years ago and his niece is one of my daughter’s best friends. 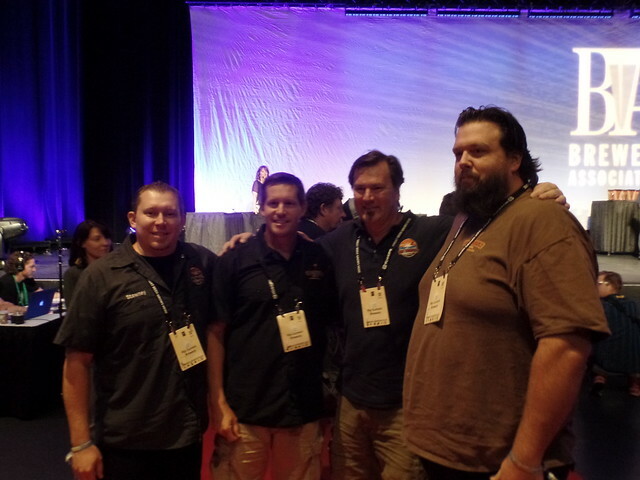 So I’ve met Paul and Guy a couple of time now, and it was great seeing them win big at the 2015 GABF. 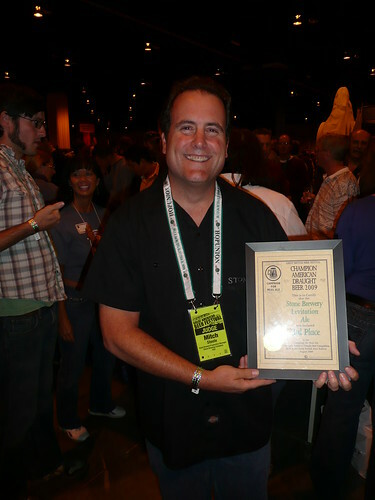 Paul is a longtime San Diego homebrewer and won numerous awards before leaving his career in 2014 to turn pro. 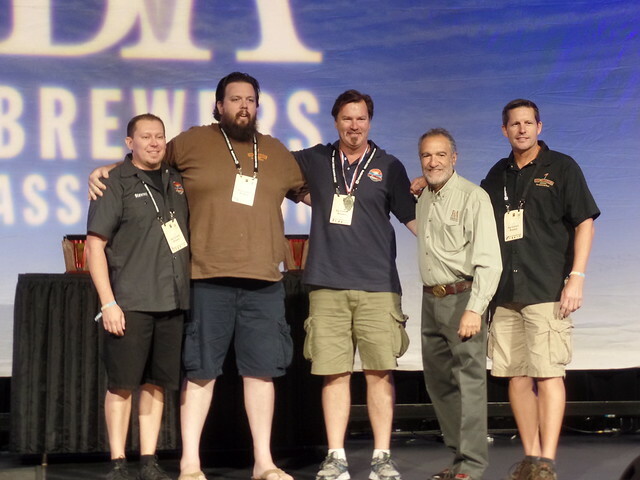 Picking up a medal at the 2015 GABF awards. That’s Paul in the center next to Charlie Papazian, and his business partner Guy to Charlie’s right. The Rip Current crew off the stage. 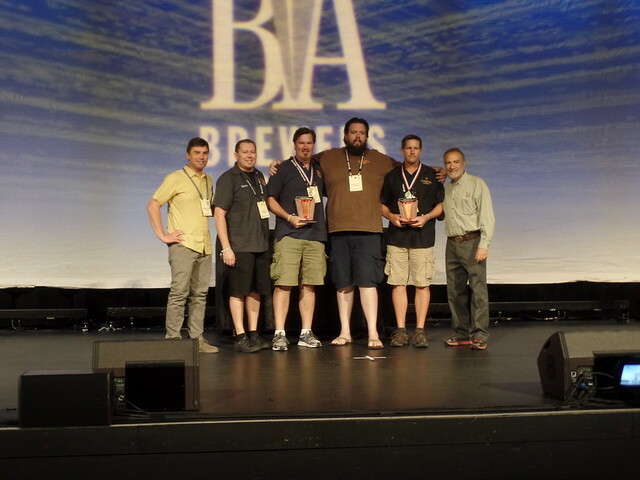 On stage again, winning Very Small Brewing Company of the Year in 2015. Winning his third straight brewing machine award at the AFC in his final homebrewing competition before opening his own brewery [photo purloined from Facebook]. 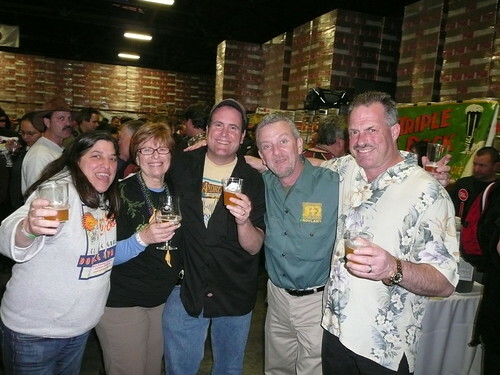 Today is also the 56th birthday of William Sysak, better known to the beer community as Dr. Bill. Dr. Bill’s massive tastings are the stuff of legends, and he’s now transported them — albeit on a smaller scale — to working at Stone Brewing’s World Bistro & Gardens. He has impeccable taste, be it in beer, wine, whiskey, cigars, what have you, and is one of the most fun people to taste with. He was working with Stone Brewing for a time, but more recently he’s in the process of starting his own brewery, co-founding Wild Barrel Brewing, in San Marcos, California, which opened last year. Join me in wishing Bill a very happy birthday. 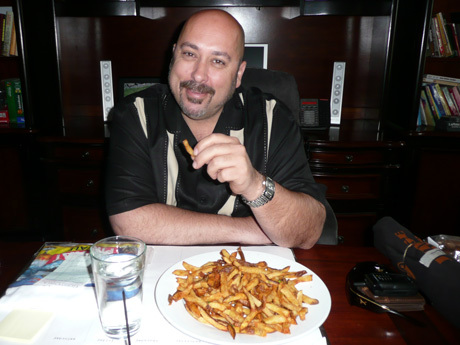 Dr. Bill and me sharing a plate of frites before the final judging at the Hard Liver Barleywine Festival in 2008. 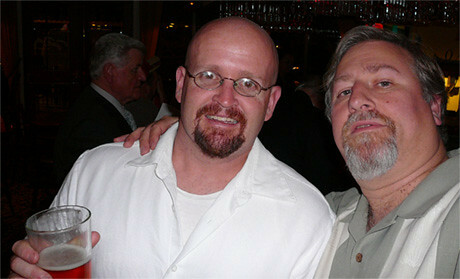 Dr. Bill with Matt Bonney, from Brouwer’s/Bottleworks in Seattle at Slow Food Nation 2008 at Fort Mason. 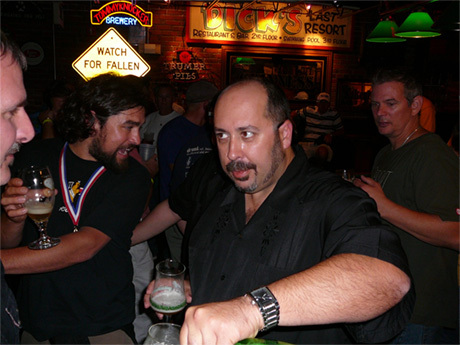 Dr. Bill at Falling Rock, hosting one of his legendary tastings, during GABF in 2006. 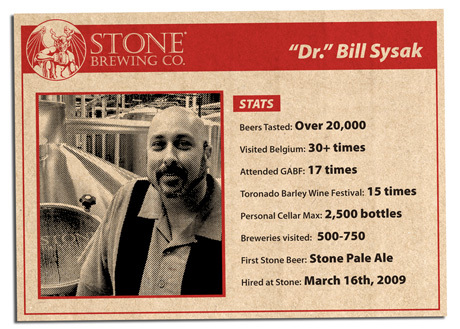 Dr. Bill’s player’s card when he joined Stone Brewing.